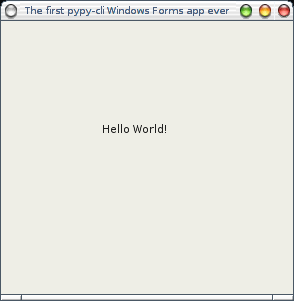 >>>> frm.Text = "The first pypy-cli Windows Forms app ever"
>>>> lbl.Text = "Hello World!" Unfortunately at the moment you can't do much more than this, because we still miss support for delegates and so it's not possibile to handle events. Still, it's a step in the right direction :-).